We’d love your help. Let us know what’s wrong with this preview of Twisted Threads by Lea Wait. To ask other readers questions about Twisted Threads, please sign up. Yes - I'm Lea Wait, the author of TWISTED THREADS, the first in the Mainely Needlepoint series. And I'm very excited about this new series. The protagonist, Angela Curtis (known as "Angel" to her grandmother) is a Mainer and most, if not all, of the series will be set in Haven Harbor, Maine. (That's down the coast a bit from Cabot Cove and Weymouth. :)) The series is written from Angie's point of view -- she's 28, and not as book-educated as Maggie Summer, the protagonist of my Shadows Antique P Yes - I'm Lea Wait, the author of TWISTED THREADS, the first in the Mainely Needlepoint series. And I'm very excited about this new series. The protagonist, Angela Curtis (known as "Angel" to her grandmother) is a Mainer and most, if not all, of the series will be set in Haven Harbor, Maine. (That's down the coast a bit from Cabot Cove and Weymouth. :)) The series is written from Angie's point of view -- she's 28, and not as book-educated as Maggie Summer, the protagonist of my Shadows Antique Print Mystery series. Angie had a rough childhood .. her single mother had a bad reputation in their small town, and she disappeared when Angie was ten. Angie herself was called names, and then lived up to some of them. Her grandmother did her best, but as soon as she finished high school, Angie lit out for anywhere-but-Maine. She ended up in Mesa, Arizona, where she worked for a private investigator. So now, ten years later, she has a gun license and experience investigating. Those who loved the antiques information in the Shadows series will like Sarah Bryne, a Needlepointer who is also an antique dealer, and the bits and pieces of information about old embroidery that is at the beginning of each chapter. And - most of all - I hope you'll get to love Angie Curtis! Reading this as a group read with the Cozy Mystery Goodreads group. This is good! I am going to like the series, I can tell already. 1. Gram is only 65 and yet she is portrayed as being as ancient, at least in her 80s, it would seem. I know her granddaughter sees her that wa Reading this as a group read with the Cozy Mystery Goodreads group. This is good! I am going to like the series, I can tell already. 1. Gram is only 65 and yet she is portrayed as being as ancient, at least in her 80s, it would seem. I know her granddaughter sees her that way, but most people I know (including myself) who are 65 or even older are capable and spry unless they have health issues. 2. The minister collects Ouija boards and occasionally communes with spirits? I didn't see his denomination mentioned, but the ministers I have known would eschew such activities as being demonic, according to the Bible, and would only be communing with the Holy Spirit. Other than those fairly major gripes, I loved the book. 2 1/2 stars rounded up. This one was a bit darker and gritty for a cozy, which isn’t bad, but wasn’t what I was expecting from the cover. Pro: I love when main characters in cozies have a job that makes their murder investigating make some sense so I was thrilled that Angie had been a private investigator in Arizona. It made her investigating make sense. I loved Harbor Haven. It's a pretty town filled with interesting people but it's also a town that's been hit hard by changes in the lobster industry and it's struggling to survive. That was portrayed very well without over doing it. There were really 2 different mysteries going on Pro: I love when main characters in cozies have a job that makes their murder investigating make some sense so I was thrilled that Angie had been a private investigator in Arizona. It made her investigating make sense. I loved Harbor Haven. It's a pretty town filled with interesting people but it's also a town that's been hit hard by changes in the lobster industry and it's struggling to survive. That was portrayed very well without over doing it. There were really 2 different mysteries going on but it didn't feel overwhelming or chaotic. The characters were interesting and even the ones I didn't like were believable. The pacing was good and even though I figured out the why before the book was through there were still plenty of twists and turns to keep me interested. Con: For the most part I loved this book but I did find Angie's interactions with Officer Pete Lambert a little strange. I liked that she took the time to deal with her pistol carry permit but then her calling and dealing with him over her mother's murder in a vaguely flirtatious way didn't seem to fit her character. Overall: I really enjoyed this mystery but I'm even more excited to see where the series goes. There's a lot of potential for some great mysteries and I look forward to visiting Harbor Haven and the Mainely Needlepointers soon! This is the first book I have read by Lea Wait. I didn’t know about her other series. I was on Amazon searching for books to add to my Books Coming Soon page and the cover just pulled me right in. The book arrived and story picked up right where the cover left off. Angie is quite a woman as is her grandmother, Charlotte. To survive having your mother/daughter disappear without a trace is just tragic. Then all these years later her body is found so very close to her home. That is heart wrenching. Angie and Charlotte had moved on with their lives but they had grown apart. Angie ended up in Arizona and didn’t visit very often. When her grandmother call her home her number one mission is to find the person who killed her mother. But her grandmother needed her help with another matter as well. Once she is home the women pick up like they were never apart and Angie starts to feel at home again in Harbor Haven. There have been some changes, some good, some bad, but Angie learns you can go home again. These are 2 extraordinary characters and I was able to relate to them so easily. The needlepoint thread that pulls the plots together is a strong one. I loved that both men and women were part of the Mainely Needlepointers. Needlepoint can be very relaxing and challenging at the same time. Angie is barely a beginner and her grandmother is the expert and the rest of the group falls everywhere in between. The murder from the past collides with the murder in the present and Angie is like a dog with bone as tries to untwist all the threads to solve both cases. As she does this she reacquaints herself with the people of Harbor Haven. She gets together with her old friends and meets several new residents. The town is a hot spot for tourists so it is the perfect setting for a new cozy series. The author has really grabbed my attention with this first book. I am so excited for the next one. Charlotte has a big day to plan for and Angie has a new job. Threads of Evidence comes out in September. I loved the little needlepoint related quotes or sampler examples which started each chapter of Twisted Threads. It’s nice touch which lured me into reading an extra chapter or two each time I read it. I really like the way the two plotlines — one hot case, one cold — were woven together by the end. It’s a little slow to get going but really gears up toward the conclusion. I really liked that Angie had a plausible reason to be an amateur sleuth and the skills to pull it off — she used to work for I loved the little needlepoint related quotes or sampler examples which started each chapter of Twisted Threads. It’s nice touch which lured me into reading an extra chapter or two each time I read it. I really like the way the two plotlines — one hot case, one cold — were woven together by the end. It’s a little slow to get going but really gears up toward the conclusion. I really liked that Angie had a plausible reason to be an amateur sleuth and the skills to pull it off — she used to work for a PI — it makes it a bit more realistic. She’s very sensible and doesn’t fall into the ‘heroine’ pit-traps of putting herself into dangerous situations without appropriate backup. I felt that the secondary characters — everyone except Angie and her grandmother, Charlotte — were a little 2-dimensional. There’s plenty of potential with some interesting characters — the elderly erotica writer, the ex-sailor with a poison garden, the Ouija board collecting minister (who’s dating Charlotte) — but none of them ‘popped’ for me. Maybe this will develop through the series. This was a fantastic and gripping read, that had me reading all day and night just to see, how the two mysteries were going to unfold. I liked the idea for a cold case mystery being the reason for the main character, Angie, to come back home. That made a big difference than an usual broken marriage or brake up with a boyfriend story line that most cozy mysteries have. It might have had a darker story line for a cozy because of what happened to cause the cold case, but, it was interesting to see, This was a fantastic and gripping read, that had me reading all day and night just to see, how the two mysteries were going to unfold. I liked the idea for a cold case mystery being the reason for the main character, Angie, to come back home. That made a big difference than an usual broken marriage or brake up with a boyfriend story line that most cozy mysteries have. It might have had a darker story line for a cozy because of what happened to cause the cold case, but, it was interesting to see, how both cold case and present case, came together at the end. This book has been sitting in my TBR pile for far too long and I am very glad that I finally read it.. I was reading another book by the same author in another series and I really enjoy her writing. The mystery is well-written and paced. With multiple suspects, it had me guessing until the very end. There were two murders within the book and the older one brings up ugly town secrets that no one wants to believe until the killer finally confesses. Have already ordered the next in this series.. Hig This book has been sitting in my TBR pile for far too long and I am very glad that I finally read it..
3.5 stars. I really enjoyed this story but I always like mixing a cold case with a new one. I did not see the ending coming with the cold case. I liked the characters and the setting and I look forward to seeing how Angie fits in with the Mainly Needlepointers. Good start to the series. This cozy mystery is will named as the story has many changes and turns. Angie returns to Harbor Heaven, Maine for her Mother's funeral. She finds some things are the same and others are different. Her Grandmother, Charlotte is in charge of a group of needle point crafters. The person who is administering the group has not shown up for 3 months and owes the group money. He has all the records and no one can located who has order what. Angie wants to find out how her Mother died. Charlotte asks A This cozy mystery is will named as the story has many changes and turns. Angie returns to Harbor Heaven, Maine for her Mother's funeral. She finds some things are the same and others are different. Her Grandmother, Charlotte is in charge of a group of needle point crafters. The person who is administering the group has not shown up for 3 months and owes the group money. He has all the records and no one can located who has order what. Angie wants to find out how her Mother died. Charlotte asks Angie to find the administrator and help start the group again. Characters are well developed and the story flows smoothly. Angie to find answer to how the party died and her Mother's death. I recommend this book highly. Angela Curtis returns to Maine after the remins of her mother are found. While she is there her Grams convinces her (she works for a PI in AZ) to try to find the manager of her Needlepoint group who owes them $27,000. Angie didn't realize what she was getting herself into when she agreed. The story kept me entertained & wanting to read more. I liked that the MC wasn't your typical cozy character. She was smart, good head on her shoulders, didn't get herself into stupid situations. Needlepoint Angela Curtis returns to Maine after the remins of her mother are found. While she is there her Grams convinces her (she works for a PI in AZ) to try to find the manager of her Needlepoint group who owes them $27,000. Angie didn't realize what she was getting herself into when she agreed. The story kept me entertained & wanting to read more. I liked that the MC wasn't your typical cozy character. She was smart, good head on her shoulders, didn't get herself into stupid situations. Needlepoint was referenced throughout the book but it wasn't to much to distract from the story. This first in a new series will win you over from the start. You will meet Angie Curtis and her friends as they come together for crafting fun. As Angie and her grandmother try to find out how Angie's mother died the group is hit with another murder and Angie has to try to clear her name as suspect. You will be drawn in by this crafty whodunit that will keep you wanting to read just one more chapter until the end. What a terrific start to a great series, eagerly awaiting the next one! First in a series that definitely has promise. Even if I don't know much about needlepoint, I liked the characters and the setting. Maine seems to be a popular place to set cozy mystery novels. I love to read most things set in the state I call home so this was a natural match for me. This story could be pulled from the headlines in my home state where a 30 year-old cold case recently resulted in an arrest. And, as a Mainer, Lea does a great job representing my home. She does resort, after the first few chapters to type. But lest you think this is a cozy with crafts, or book suggestions or recipes; I am hear to tell you it is a darker shade of cozy, although it’s not quite a procedural; there’s not quite enough police cooperation. Angie is an investigator for a private detective when she moves back to Maine. That automatically puts her into a grittier place than the librarians, store owners, writers and caterers that normally populate cozies. And, it deals with two really heinous crimes and child sexual abuse. While I suspected the perpetrator, I didn’t see how Angie deduced the identity of the killer. I may not have listened hard enough but it seemed sudden and based on intuition and a couple of facts. The narrator does a great job with the voices and the only thing that bugged me was overly-aged voices. There were some people near my age and I KNOW that I don’t speak in a creaky old-lady voice. I liked the writer’s attention to detail, and the depth of the main character’s journey through solving her mother’s death. The way her mom was seen, and who she really was shows depth in Wait’s writing. I also enjoyed some insider Maine jokes, like the location of a nearby casino. And, as a resident of the state I love to live in I am pleased that she gets it right. This is a great 1st book in a new cozy series, set in Harbor Haven, Maine. Angie Curtis hasn't been back to her hometown in 10 years, not til her grandmother, Charlotte, calls and tells her her mother's body has finally been found. Angie rushes home and finds many changes have occurred since she was last there. Her grandmother Charlotte has opened a needlepoint business and has a few employees that work with her. Along with that, a middleman who has swindled the group out of $33k. While trying t This is a great 1st book in a new cozy series, set in Harbor Haven, Maine. Angie Curtis hasn't been back to her hometown in 10 years, not til her grandmother, Charlotte, calls and tells her her mother's body has finally been found. Angie rushes home and finds many changes have occurred since she was last there. Her grandmother Charlotte has opened a needlepoint business and has a few employees that work with her. Along with that, a middleman who has swindled the group out of $33k. While trying to solve her mother's disappearance and murder, Angie also has to deal with the crook who stole the needlepointers' money who also ends up dead in Angie and Charlotte's house. Well, when I first started this book, I thought, I don't think I am going to like this book very well, but boy was I wrong. Once I started it, I didn't want to put it down. There were so many things happening in this book, my head was almost spinning. Not only does Angie want to try to find out what really happened to her mother, she also has to find her grandmother's business partner. Then she has to solve another murder. I liked the characters and the setting of this book. I am looking forward to the next installment in this series. Interesting cozy set in Maine. I thought it was a cut above the general current crop of cozies, where every character and plot twist is totally predictable. The MC feels like a real person, and I liked her relationship with her grandmother. I also enjoyed the needlepoint details. I'm still not quite sure how the heroine figured out who killed her mother - it seemed like she just suddenly knew. But I still enjoyed the book and will probably read more. Yes, cozy mysteries can be pretty predictable and all, but that's what I like about them. When I get a cozy mystery, I expect it to be fairly light (if it can be light with murder involved) and enjoyable. But this wasn't the case. I went in expecting one thing and came away with something completely different. Not in a good way. The reason for the cold case murder was abhorrent, and didn't fit the cozy mystery genre, though it fits the mystery genre (Mary Higgins Clark, etc.). Angie’s mom disappeared a long time ago when she was nine years old. There was a lot of rumors to what happened but pretty much everyone thought she ran off. Angie moved from Haven Harbor to Arizona and works with a Private Investigator, but now her Gram is calling her home. They found her mother dead in a freezer. Angie comes home to find her Gram has changed a little, she has a cat, a boyfriend and a new business. Mainly Needlepoint started off small as Gram would do needlepoint projects for th Angie’s mom disappeared a long time ago when she was nine years old. There was a lot of rumors to what happened but pretty much everyone thought she ran off. Angie moved from Haven Harbor to Arizona and works with a Private Investigator, but now her Gram is calling her home. They found her mother dead in a freezer. Angie comes home to find her Gram has changed a little, she has a cat, a boyfriend and a new business. Mainly Needlepoint started off small as Gram would do needlepoint projects for the local stores to sell during the tourist season and then it picked up from there. A man approached her, Jacques Lattimore, about selling on a broader scale to high end clients and so when things go foul she has a few unhappy needlepointers. Angie agrees to help her Gram find Lattimore and she does and then during a meeting with all the needlepointers he dies. Was it one of the needlepointers or did it happen before she nabbed him and brought him here. Knowing that she and her Gram could be suspects she tries to figure out who might have wanted him dead. For the most part I enjoyed Twisted Threads, the characters are interesting and it will be fun to get to know them all more as the series progresses. Angie, has to deal with the fact that her mother has been found dead and it sort of closes that hole inside of not knowing. At least they know she didn’t run off and abandon them. Gram is a sweet order lady and I thought it was cute that she had a boyfriend. I kind of liked the fact that there was no romance involved in this nor a budding one. The detective involved even though they went to school together and Angie seems to have a crush on him, is married. There was another officer involved and mentions of him being nice looking but nothing went anywhere with that, not that it might not change in future installments. The one thing that really bothered me with this book has more to do with my religious beliefs more than a horrible plot line. The minister has a collection of Ouija boards and he even uses them on occasion. When Angie ask about it they use it to try and see who killed Lattimore. It just so turned me off because I personally don’t like those things but I have always been taught they are bad. I can handle it being a regular person that is using it, but NOT a minister, that is just totally wrong and I didn’t like it. Angie has come back home to Maine to bury her long missing mother and help her Gram deal with the aftermath. She has a life in New Mexico, but has missed Maine. Life has gone forward for everyone since she's gone, some for the better, others not so much. 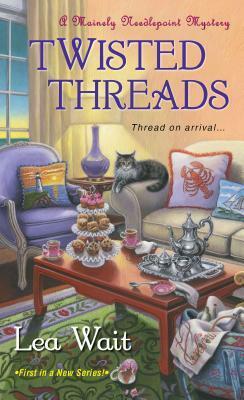 Twisted Threads is the first book in the Mainely Needlepoint Mystery series. Angie is working in Arizona with a private investigator. She receives a phone call from her Gram to return home to Haven Habor Maine because her mother's body has been found. Angie's mother disappeared when she was a child and she has endured gossip and stares since then. This is added on to the deep pain she has felt as to why her mother left. I really liked this book. It was an edgier cozy mystery. 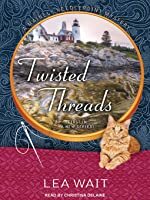 It had surprises for Twisted Threads is the first book in the Mainely Needlepoint Mystery series. Angie is working in Arizona with a private investigator. She receives a phone call from her Gram to return home to Haven Habor Maine because her mother's body has been found. Angie's mother disappeared when she was a child and she has endured gossip and stares since then. This is added on to the deep pain she has felt as to why her mother left. I really liked this book. It was an edgier cozy mystery. It had surprises for me as a reader. I liked that there were two mysteries-one from the past and a current one. Angie is an interesting character as she has built somewhat of a shell around her due to the hurt she felt growing up. She is not a girly girl. I felt that you couldn't fool her easily as she is aware of human nature. She is intelligent and has a business mind. I liked this first in the series book. I will be looking for more to see how Angie deals with moving back to Maine. Angie finally gets to find out what happened to her mother when she disappeared so many years ago. Maybe she wasn't the best mom but she was Angie's favorite mom and so it was good to find out what really happened. Angie and her grandmother are very good people to read about. And I like to read about Maine, a place I would like to visit more often in person. In the meantime, I will v I liked this first in the series book. I will be looking for more to see how Angie deals with moving back to Maine. Angie is called back to the small town in Maine she grew up in because they found the body of her mother after almost twenty years. So many changes and murders to solve. Good book with an excellent twist at the end. Not a particularly good book, nor particularly well written, but suitable for reading when one's life is in disarray, so it did what I needed it to. Loved this book, couldn't put it down! I loved the characters and storyline. Will be reading the next one for sure! Ten years ago, Angie Curtis left the small town of Harbor Haven, Maine for sunny Arizona. However, one phone call sent her back to Maine. After almost twenty years, her mother's body had been discovered. What happened to Angie's Mom? Will Angie uncover what happened? This was a nice start to an interesting series. I liked all the history and needlework quotes at the start of each chapter. Thanks for the recommendation, Amanda! I've read the entire series and have enjoyed them.